Elephant Bedroom Camp offers luxury in a setting of breath taking beauty along the banks of the Ewaso Nyiro River and shaded by doum palms and other trees that make up this green belt of riverine forest in Samburu National Reserve. The surrounding Samburu National Reserve is an area of spectacular scenery; its dry plains bisected by the meandering river, with the backdrop of Africa’s dramatic mountains, including Mt Kenya. The 12 spacious tents have rustic and colorful African touches, offering all the comforts; including a private plunge pool on the deck, hot and cold running water, electricity, and complimentary herbal shower and bath products. Dining is a culinary experience with alfresco breakfast, 3 course lunch and 4 course candle lit gourmet dinner set either under the African sky or inside the well appointed dining area. The lounge and dining area at Elephant Bedroom Camp is decorated in vibrant safari style, its soft intimate lighting assuring that this is the ultimate place to relax in between exciting game drives. 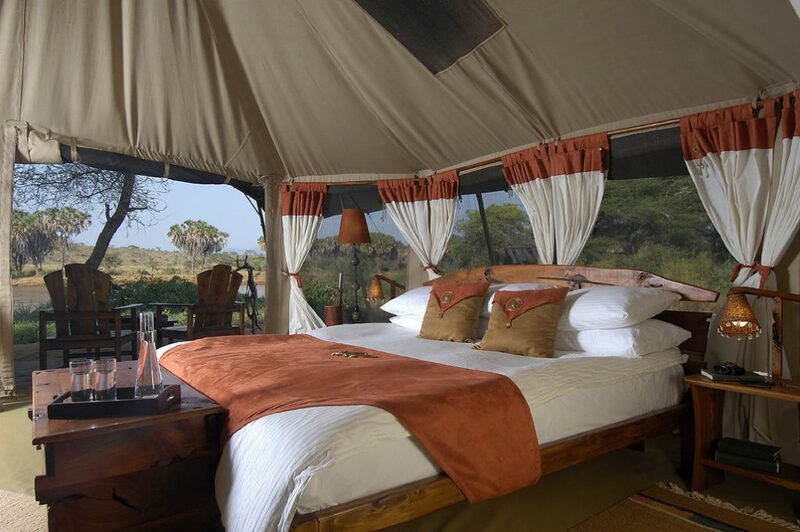 Elephant, monkeys, and impalas are among Elephant Bedroom Camp’s many regular wild visitors, whilst Samburu National Reserve has a good number of lions and leopards and offers the opportunity to see many species endemic to northern Kenya.